Esmee Portelli, Dailyn Falzon, Maria Aquilina, Jeanine Pisani, Mirianna Mulé Stagno, Mathias Abela, Michaela Abela, Gabriel Attard, Katrina Portelli, Daniel Vella, Jade Galdes, Maya Muscat Scerri, Linn Muscat Scerri, Jean Claude Randon, Amanda Brincat, Zoe Wong, Janice Curmi, Maria Christine Curmi, Natalia Ferris, Andrew Galea, Maria Galea, Anouk Ladret and Sarah Bezzina. The history of a place is always connected with hidden secrets, which are mostly forgotten. In the phase of introduction the children were invited to explore and percept the space of St. James Cavalier Centre for Creativity. The old staircase, chosen for the exhibition, was inspiring to start the work. The children discovered how to move, the best place to be in, to explore from a specific angle and create stories. Hidden secrets are creating in the fantasy monsters, all kind of figures or animals. The children tried to get into the body movement of a monster or animal and they started to experiment with mouth and fingers to create special noises and rhythms. The children initially expressed their fantasies with sketches in chalk and charcoal on small scale paper. In the next step they painted on large scale paper with natural earth pigments. 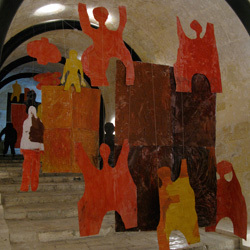 In the third step the figures were cut out. And finally the children created collages with the left overs of the paper. The variety of the figures and forms in realistic and abstract versions is impressive: monsters, a devil´s heart, ghosts; Batman flower and starshuttle. Children’s art is not just a question of fantasy in creating forms it is also about personality, concentration, imagination and concept. Children are made aware of composition, elements, lateral space, totality of the image, balance between organic and geometrical shapes and reduction. Their wonderful feeling for colour and space is natural and real. Children understand the contemporary language of art with ease and naturalism. Luise Kloos is living and working in Austria. Luise works in paintings, drawings, installations and interdisciplinary performances. She is exhibiting and teaching in many countries like USA, India, Great Britain, Austria, Germany, Hungary, Finland, Slovenia and Croatia. Luise is inspired from different cultures and applies these impressions for her work. For many years Luise Kloos has been working with children in many different workshops and international festivals.